STEM in Schools - what does it look like? Last week, I wrote a mini-explainer on what STEM is, and my thoughts on STEAM. This week, I'm going to describe what my definition of STEM looks like in the classroom*. WHAT IS STEM? 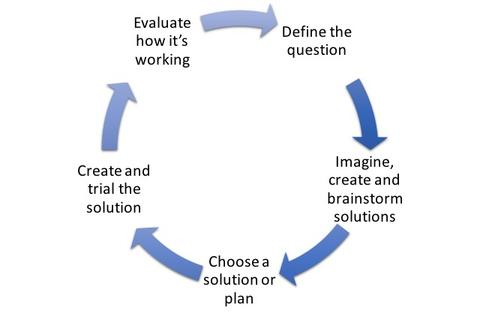 DOING STEM MEANS TO USE ENGINEERING DESIGN PROCESSES TO CREATE SOLUTIONS TO QUESTIONS OR PROBLEMS. WHAT DOES DOING STEM LOOK LIKE? In short, it means students are free to choose or create their own solutions, trial them, evaluate whether the solutions worked and then improve or alter their solutions. It means there is no singular right answer and there ends up being variation between the solutions students are proposing. There can be poorly-suited design solutions of course, but the idea is that students are not being funnelled towards a pre-determined solution. It is this reason that I don't see playing with a robot or flying a drone as doing STEM because neither scenario is a solution to a question or issue and it is a pre-determined learning outcome. Setting constraints is of course a necessary part of this process, especially to mimic what happens in real-life, and depending on the situation the constraints might be quite tight. There is a difference though between setting a constraint where students are genuinely free to choose between options within the boundaries and requiring all students to do the same thing. You might, for example, ask students to design a robotic toy using a micro:bit to help a younger student learn the alphabet - but exactly how they design their robot (how it functions, what it looks like, how it is coded etc.) is entirely up to them. The "improve or alter their solutions" is one of the key parts of the design cycle for me. So often, students put all this work into designing something, they test it and then it's over (the common design challenge of "build the strongest bridge using only these materials commonly falls into this trap"**). To truly develop their evaluation and design skills, students need to be able to analyse their solution and be given the chance to change it until it really works how it should - or be given the opportunity to complete start again if something is deemed to be unsuitable. Failure is a good thing if students have the opportunity to learn from it. As a teacher, I know this is hard to manage all the things we need to find time for, but it really is a key part of this process and it is essential in developing the life-long skills students need (no matter what career area they undertake). WHAT FOUNDATION OF SKILLS AND KNOWLEDGE DO STUDENTS NEED TO BE ABLE TO DO STEM? Being able to do STEM properly means students need the skills and knowledge to investigate, evaluate and use - or probably more importantly, know how to learn to use - a range of technologies. This is where coding activities, building robots and learning about drones IS important. It's also where research skills (such as those often developed through languages and the humanities), creativity and evaluation skills need to be developed. To be able to develop students' skills and knowledge to do STEM, it is essential you have a structured learning plan to develop and improve these skills. Too often I see students engaging in coding as a one-off engagement activity, not as a series of sequenced and structured lessons to properly develop students understanding of coding and their coding abilities. The same applies with design skills: one of the most frequent "design challenges" I see is to get students to build a bridge that can support the most weight. Whilst this almost could count as doing STEM**, an is certainly engaging, by itself it is not assisting students to develop their design process skills. Additionally, individual subjects often teach research and other cross-curricula skills, but too often these are taught in isolation without links made to other subject areas (this is where school leadership and administration has a big role to play in making sure they are fostering an environment where these collaborations can take place - it is not down to an individual classroom teacher to make this happen). Students skills in these areas need to be assessed so that targeted teaching and learning can take place to help students build the solid foundation they need to let their imagination take them to wherever they want to go and solve the big issues. Take a look at some of the rubrics we've created to help teachers assess their students' skills here and plan for their learning (more coming soon!). To make it clear, I'm not saying to stop doing one-off activities that spark student interest and engagement - these are important - but it's not enough to rely on these activities for students to develop the foundational skills they need to do STEM in earnest. These are all STEM solutions. Each solution incorporates analysis and understanding of the problem (maths and science), selecting the appropriate tools for the solution (technology) and evaluating and designing the solution (engineering). It also incorporates other subject areas - languages, humanities, art... It's ok that these aren't specified in the name 'STEM' because STEM is a way of thinking. After trialling their solutions and collecting results, students would then have the opportunity to re-design their solutions, making improvements or if they need to, admitting failure and starting again. This process would happen at least a few times. Many people are already doing an almost-there version of STEM, especially in primary school inquiry-based learning. Ensure students have a solid foundation in a broad range of knowledge and skills by purposefully providing structured learning sequences that develop their knowledge and skills (especially in areas such as research and evaluation skills, coding and design technologies). Start with a question or issue to investigate, research it and then propose solutions. Allow students to propose a range of solutions and get them to justify why they have chosen them. After students make their solutions, have them trial, evaluate and improve them. Provide the opportunity for students to trial, evaluate and improve their new designs again. And again. And again. For as long as possible. Objectively assess the skills students are demonstrating and provide targeted opportunities for students to improve on these skills. Have you got some examples of doing STEM (or almost doing STEM) that you've used in your classroom? Do you have some questions about how you could turn an almost-there STEM activity into a doing STEM activity? We'd love to hear about them. Please feel free to add them to the comments below. ﻿Coming up: recommended technologies for building the foundations of STEM. *My understanding and opinion of what STEM is comes from working as a teacher, a scientist, being part of engineering research groups and undertaking a PhD in STEM education. It also comes from reading the research literature around STEM education. I'll admit that there is no one right answer to the question "what is STEM" but I aim to define it to enable teachers to do something with it that is useful for students. In a later post, I might write a referenced history of STEM education, but for now this will have to do. **A 'build a bridge' design challenge could almost be classed as a STEM activity if students are given the opportunity to evaluate and improve on their design - but sadly, this part is normally missing.